Australia and Singapore have become the latest countries to suspend the use of the Boeing 737 MAX plane after the model suffered its second disaster in less than five months. It follows the Ethiopian Airlines crash in Ethiopia on Sunday which killed all 157 people on board - including nine Brits - and the Lion Air crash in Indonesia in October which killed all 189 people on the plane. The temporary suspensions issued by Australia and Singapore on Tuesday come after Indonesia and China grounded the model's flights on Monday. It means nearly 40 per cent of the 371 models are out of service, with China – the 737 MAX's biggest market – accounting for 97 of the jets. Individual airlines in countries including Brazil, Argentina and Mexico have also grounded the aircraft. The United States, though, stressed it was safe to fly the planes. But the scare has wiped billions of dollars off Boeing’s market value. The world’s biggest plane manufacturer’s share fell by 13.5 per cent at one point on Monday. No link has yet been established between the Lion Air and Ethiopian Airlines tragedies. 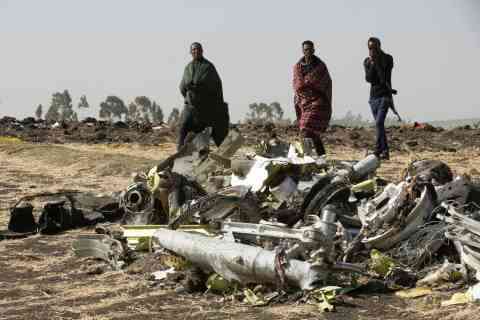 But investigators in Ethiopia have found two black box recorders that will provide information about what happened before the plane plunged into farmland minutes after take-off from Addis Ababa. As long as the recordings are undamaged, the cause of the crash could be identified quickly - although it typically takes a year to fully complete an investigation.